You know we love our hiking, right? We do it almost everywhere we go, and in all types of weather and environment. 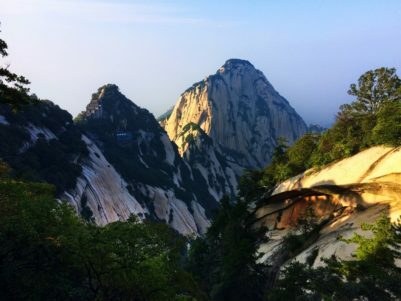 This year has seen some really fun hikes from lighthouse hunting to trekking through the snow in the spring, and now I can add hiking Huashan in the Shaanxi province of China. 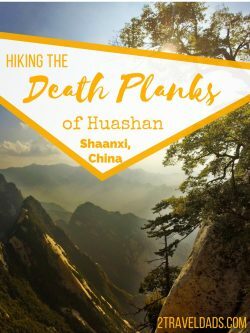 Huashan is the home of the death planks. 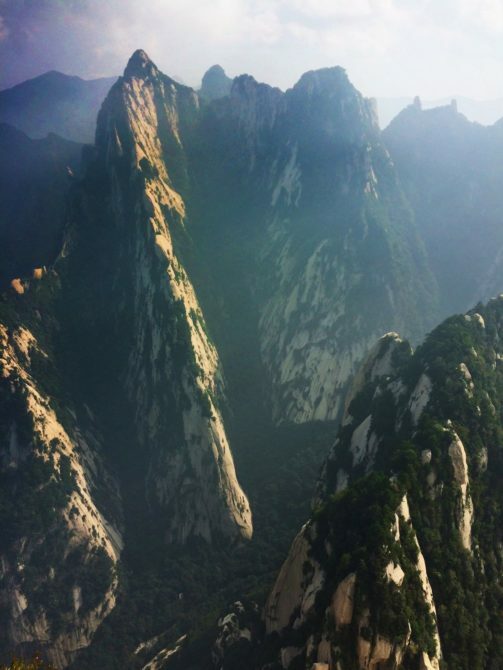 While exploring Shaanxi province, we got to visit several Chinese National Parks, of which Huashan is one. We visited while staying in Xi’an. The drive wasn’t too bad and I’d do it again a thousand times. So, have you heard of this place I’m talking about? The death planks? Well, let me enlighten you. 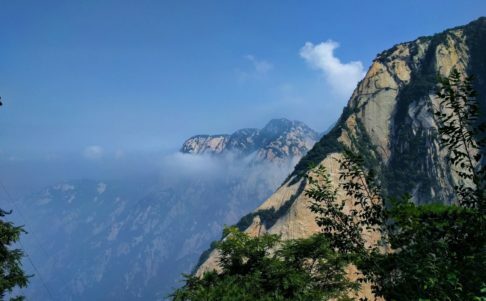 If you’re visiting Xi’an, the really cool and incredible tier 2 city and capital of Shaanxi, you’ll have about a two hour drive into the mountains before you come to Huashan National Park. 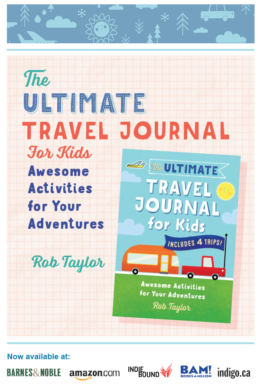 It’s quite the adventure and you’ll love most moments of it. The view along the way includes loads of terraced farms and river valleys. 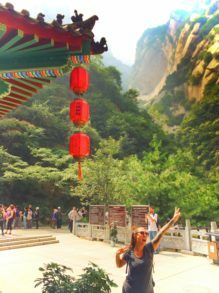 China was so wonderfully surprising for so many reasons! 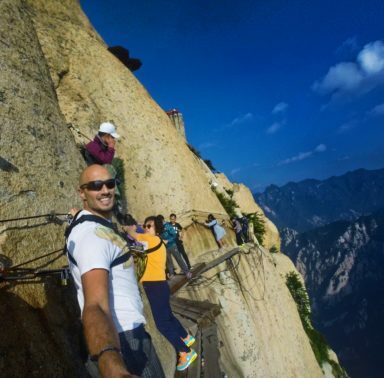 Something to note about heading out on a road trip to do the death planks hike at Huashan is that there aren’t many easy places to stop along the way. You’ll no doubt get to experience the awesomeness that is the Chinese rest area. Seriously, you’ve never seen anything quite so…impressive when it comes to restrooms. One of the rest areas (service areas) we stopped at had over 70 toilets in the men’s’ room. I’m not joking. Huge bathrooms off the highway. Tip: 80% of the bathrooms I went into throughout China didn’t have hand soap; just towels and cold water. After day 2 I remembered to grab a small bottle of soap from my hotel room for the express purpose of washing hands. 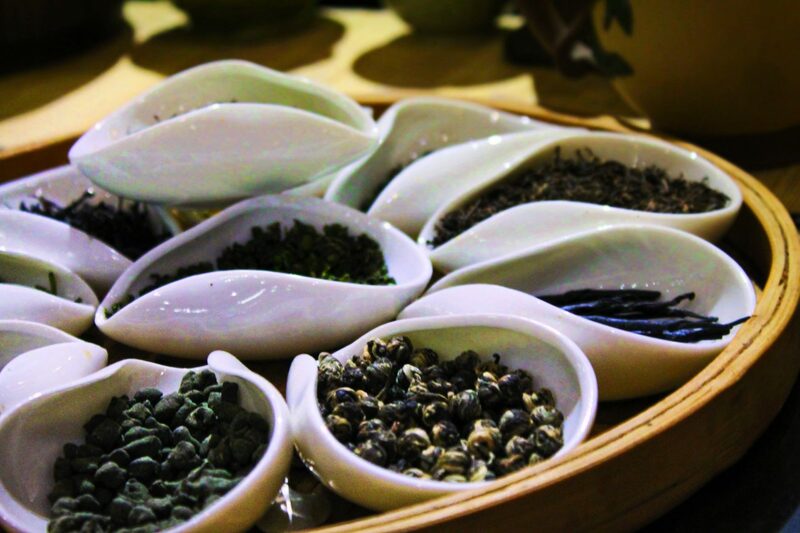 Since you’re heading a bit northeast out of Xi’an, you’ll have the opportunity to have some more local foods when you stop to eat. 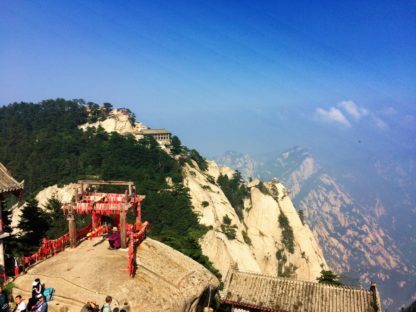 There is a bit of a town before you reach the Visitors Center, so be sure to pop into one of the restaurants to fill your tummy before the crazy death planks hike up on Huashan. 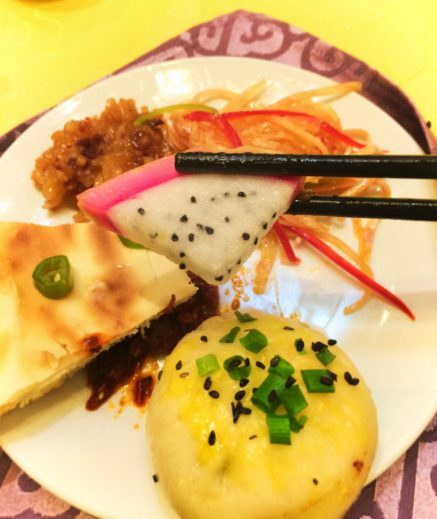 And if there is dragon fruit available, you need to try it. It showed up randomly on our plates in lots of places and it was the most perfect food ever and I’m kind of obsessed. 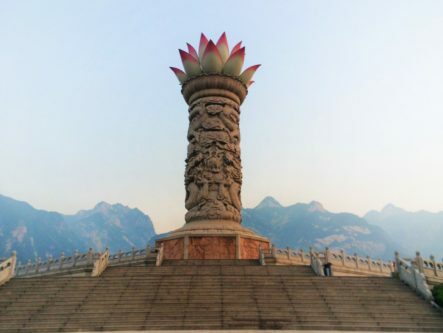 Like National Parks in the United States or Canada, there is a Visitors Center at Huashan. 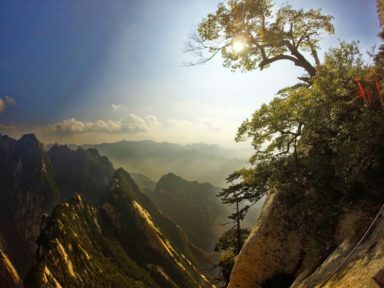 It has information about the Park, the mountains themselves and the process for visiting. It’s here that you’ll purchase your tickets to enter the National Park. 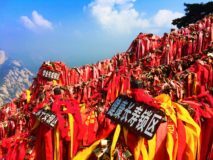 Note: you need to buy two different tickets per person, one for the bus up into the mountains and one for the gondola/cable car/skyride to the lowest peak. 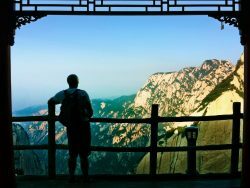 While you’re at the Visitors Center, take a few moments to get familiar with the maps of Huashan National Park. 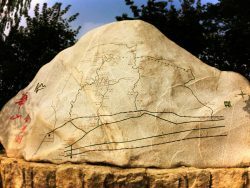 You’ll see both a 3-D relief map and large hiking maps. 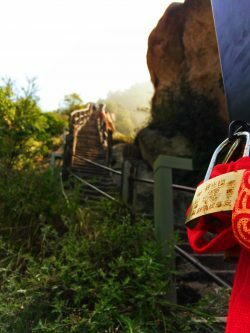 Even though there are signs to direct you up on the mountain, you’ll need a plan of attack before you’re ascent. 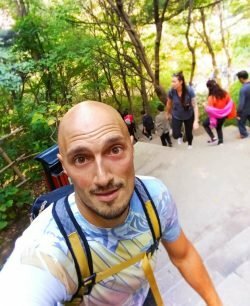 This is a great time to decide what you’re interested in and capable of… and if you’re actually going to do the death planks hike. 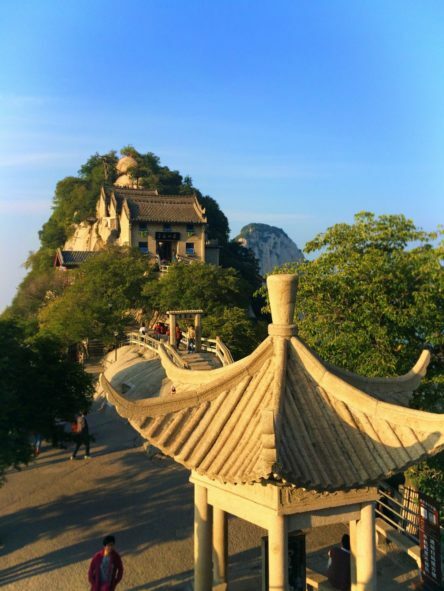 Tip: if you can find a local that speaks English, or if you’re with a tour guide, ask for a recommendation of the route to go, as there are different temples and viewpoints you may wish to see. 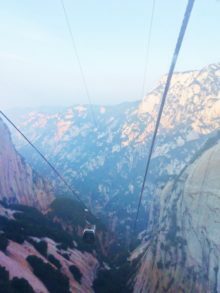 Heck, there’s even a second gondola line if you’re just in the mood for 45 minutes of sky-riding. 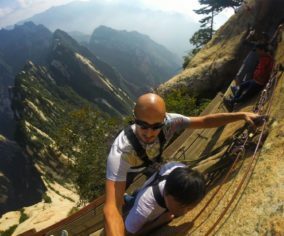 Tip: a visit to Huashan National Park, and particularly going all of the way to the death plank hike, is a full day activity. Don’t think you can do this and then go crazy afterwards. You’ll be sleeping before you’re back at your hotel. 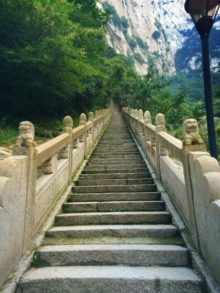 So, hiking in China isn’t like hiking in North America; we visited several Chinese National Parks on our tour of the Shaanxi province and each had stairs everywhere. 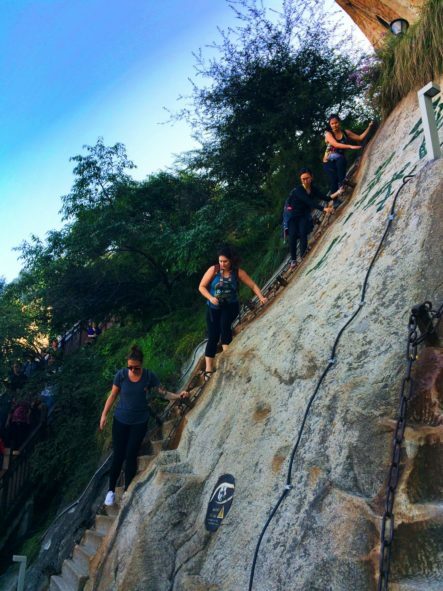 Huashan was no exception and the stairs actually made the day much more of a workout than we’d planned. The real test of leg strength came on the descent from the last peak, as each step jarred the muscles a bit more and by the end you’re just walking jelly. But beyond the heights and the crazy stairways all over the mountains, there were epic distractions all around. 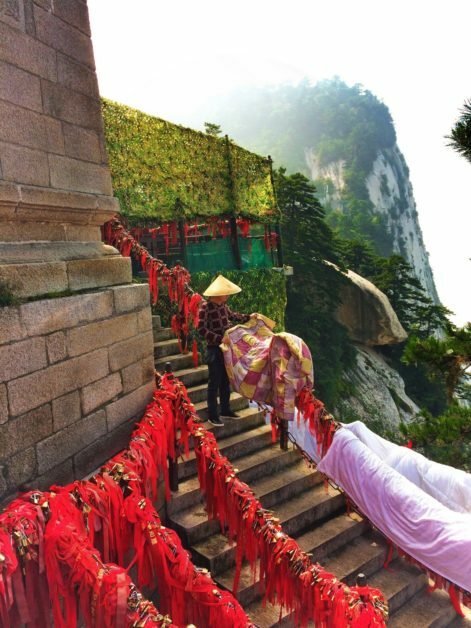 In Buddhism, often the mountains are holy places, so there are many temples way up high. 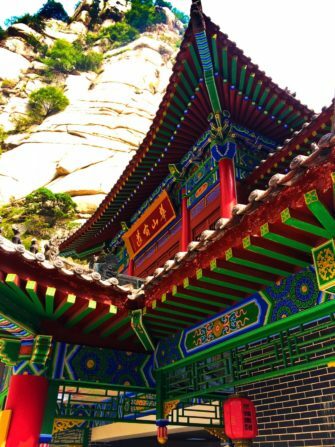 As we were hiking Huashan we visited at least five different temples. 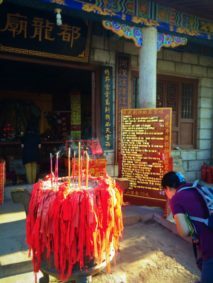 Each had a very different statue of the Buddha and all were active sites where people could pray or light incense. They were all so colorful and so beautiful. 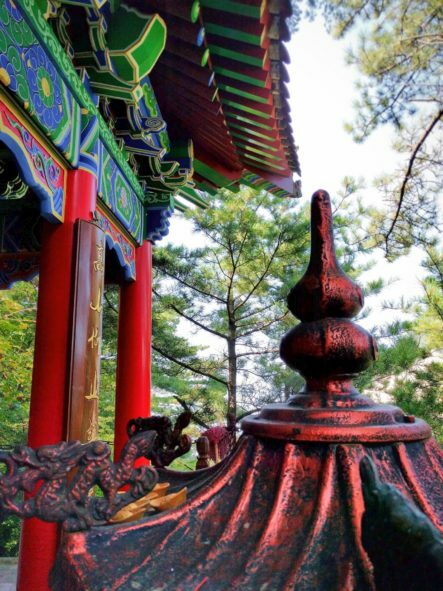 Colorful China. 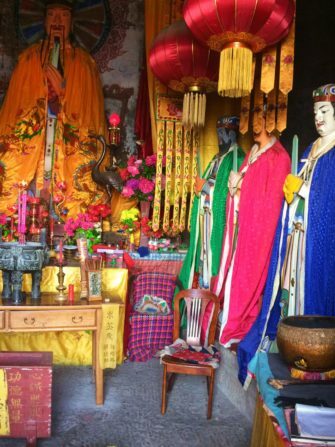 Note: it is fine to photograph the temples and activities, but be respectful and unobtrusive. 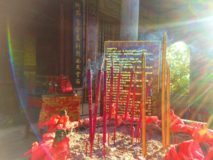 There are certain temples or rooms as you’re touring through China where you’ll see signs prohibiting photography though, so be aware and obey those notices. 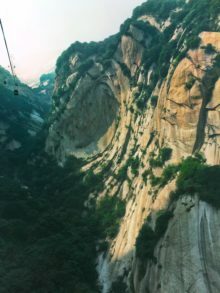 Before you get to the top of Huashan and start your climb along the planks, there is a lovely warning for hikers (I’m sure in Mandarin it’s a bit different): “Those who are brave may walk at ease while those who are timid would feel rather horrified.” True story. 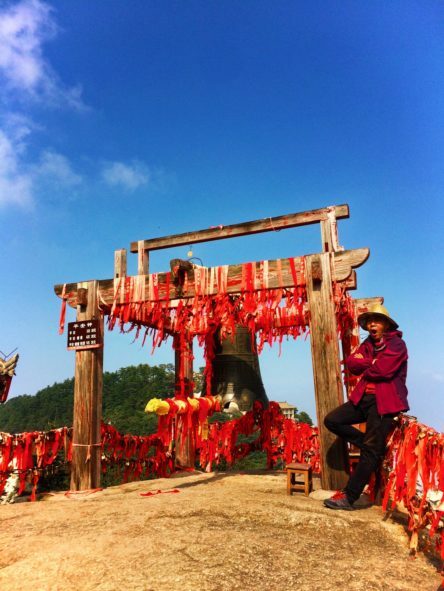 Note: you cannot take your backpack or cumbersome camera equipment on the death planks, so you’ll have to leave it at the harness station by one of the many temples. It felt totally safe and everybody’s belongings were perfectly fine upon our return. 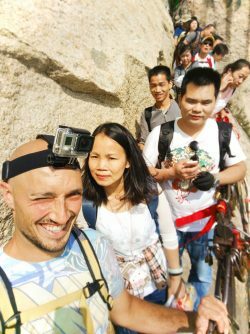 And oh yeah: despite your valor and stamina after hiking to the top of Huashan, you have to pay the piper to get a harness so you don’t plummet to your death. 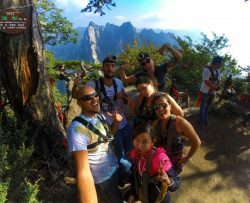 When we hiked the death planks it was 30 RMB (about $5 USD). 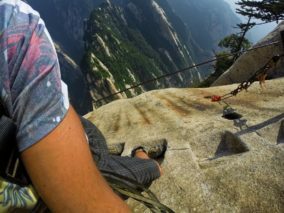 And then you’re stuck hanging out on an iron ladder, grip giving out why more hikers squeeze past you to exit the death planks trail. Once I was finally able to get off the iron gridwork, it was a breeze, meaning it was a tad bit windy out on the ledge, and the sound of crying birds flying below was startling. But the view was amazing. 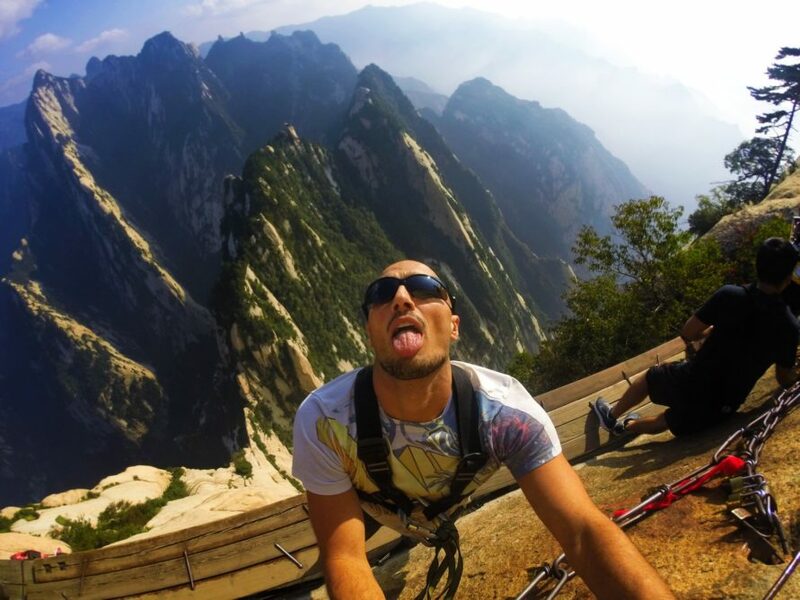 Really, I didn’t know that Huashan was on my list of must-do things in life, but once I started to grip the wall and slowing make my way through a mountain valley thousands of feet in the air, I realized that the death planks hike was truly a once in a lifetime activity I wouldn’t forget. After about twenty minutes of gripping, switching cables and trying really hard not to look down, the planks ended and there were yet more stairs to climb. The last stretch wasn’t bad though and at the end lay a really amazing view and perfectly serene small Buddhist temple. 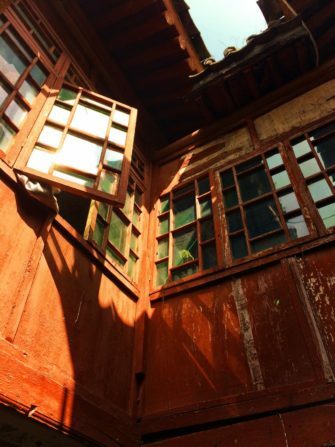 We didn’t linger long here, even though we could have. Remembering how many hikers had to shimmy past us on our way across the planks, we all had this moment of realization where somebody said “We’re going to be the ones trying to get past everyone now…” and we headed back. 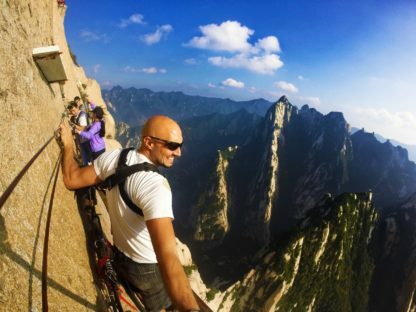 Yep, climbing around loads of people whilst dangling 7000 feet above the valley floor, um, a bit creepy. Be sure to stop and just look at the amazing scenery. It’s really unlike anything I’ve seen on earth. 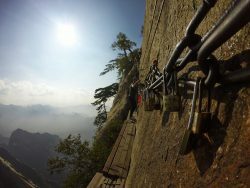 I’m so glad that I got to climb Huashan and scale the cliff-sides. It was never a bucket list item for me, but I can honestly say that it’s one of those things that you just have to do at least once in your life. It’s funny. 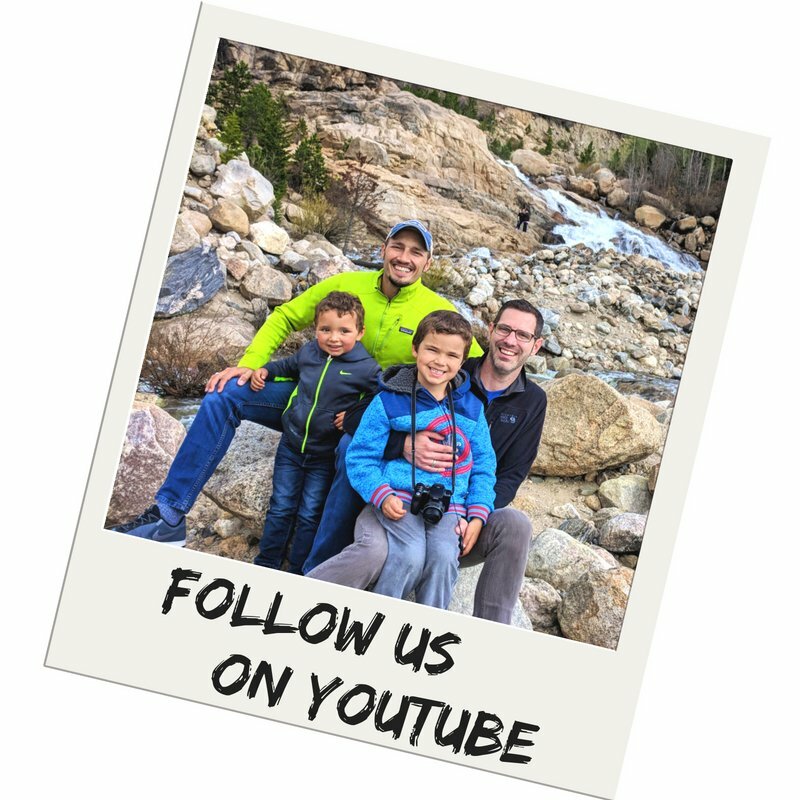 Oliver, our oldest, said that he wanted to do the death planks hike too. 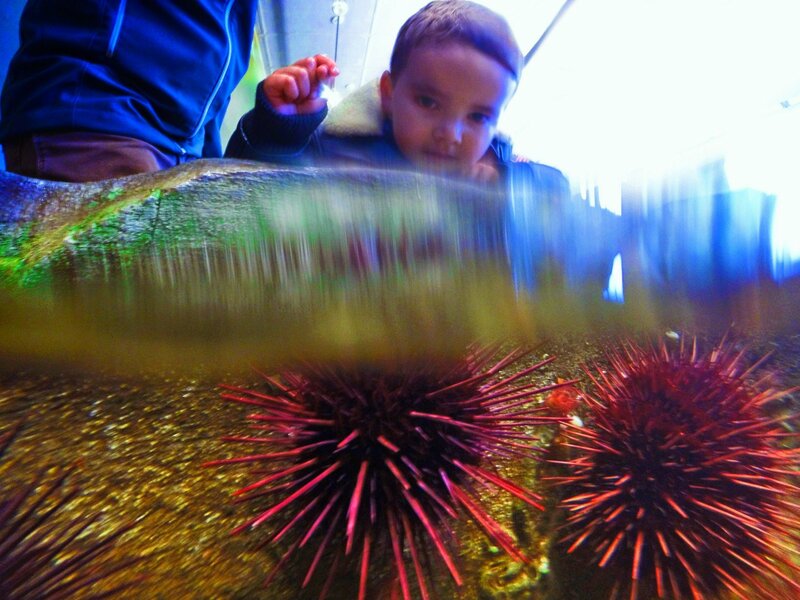 Yeah, um, when he’s older we’ll see, but I cannot imagine taking him up to the death planks. 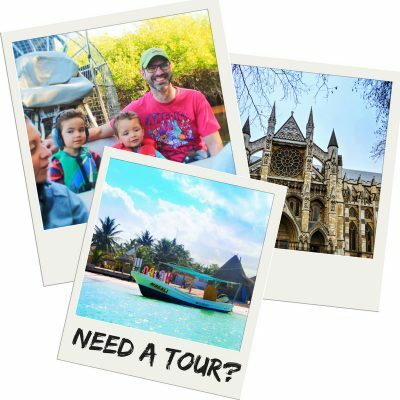 Only time will tell if we do it as a family, but for sure we need to find a way to all see some of these amazing sights together! Woah! I have anxiety just looking at these photos! I like to think that we are good Hikers (we hiked to the bottom of the Grand Canyon and back in a day) but this is seriously intense. That view though! I can’t even imagine how awesome that looks in real life. 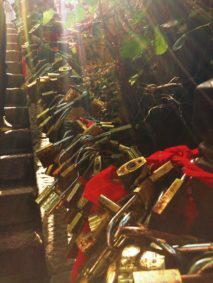 That’s so beautiful, but really I don’t know if I would have been able. 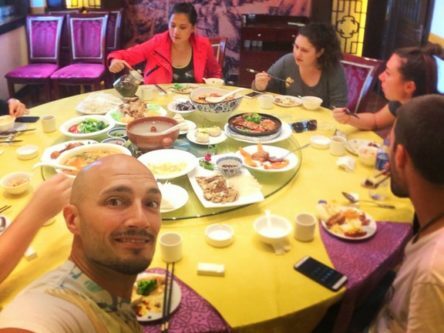 I had a Chinese group trip when I was visiting the surroundings of Xi’an. It was a crazy day, always running to go to the next attraction. 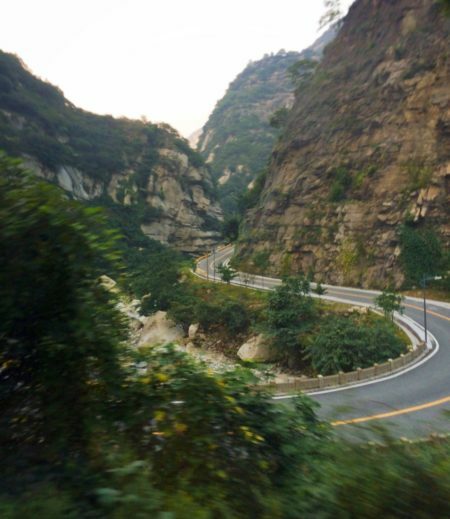 So I can imagine these people trying to go always faster and squeezing you… Quite scary in such a place! Gorgeous! 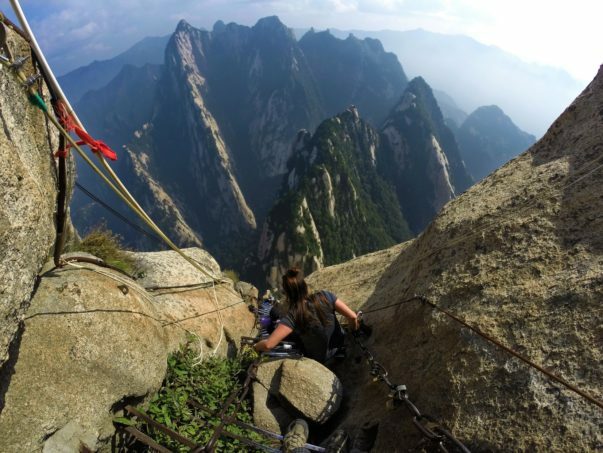 I don’t think I could make the hike, it looks too scary! But the view at the end looks so worth it! The hike looks really exciting. 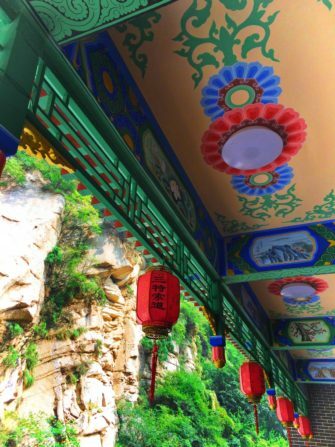 The vibrancy and colour of the Chinese culture are so evident everywhere in your pictures. I am sure you had a lovely experience on the hike. Wow, this is so awesome. I just stumbled across your blog from a comment Chris posted on Facebook through a mutual friend. I work at the SSC, and met Chris my first couple weeks riding the shuttle! (I’m in the PCC, and was told that Rob you spent some time there too.) You guys are awesome, can’t wait to read more about your adventures. You have really gotten us onboard for China. We were always sort of on the fence, but your photos and stories have convinced us otherwise.